Kitty Corp Meow Mix Forums | Help & Tutorials | Help (Moderator: Gamma Ridley) | Polygons and irises. I did what you said, no polygons have it assigned. With that said, when I untoggle FitSheik00EyeIris in the Model Viewer in Brawlbox, EyeShadow and EyeHigh are untoggled as well, and the other way around. So, 2 questions: What version of Brawlbox, and is your goal to import this back into Brawl after edits and/or rerigging? 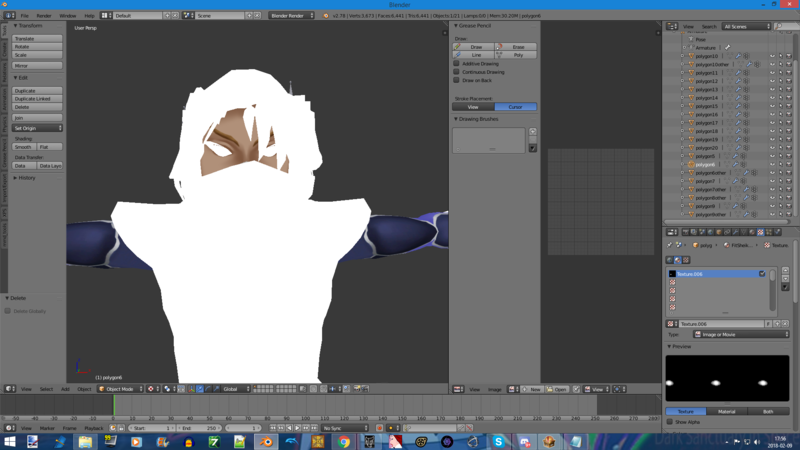 I'm using 0.78, and my goal is to port the model to Source Filmmaker. The two eye polygons do however have FitSheik00EyeHigh assigned to them. I might have to do that. And with 0.78, I can see the iris when I preview the model. And yeah, it's safe to assume Blender only imports one material for polygons. You can combine some of them with Gimp or Photoshop; technically, you can combine all of them, but if you want the reflections, I recommend not merging those textures with the other textures; does SFM natively support reflections, like Unity does? Ah, fair enough. Yeah, SFM has that. With that said, I don't see how I can combine them since they're almost all different sizes.